Always personal, never less than adventurous. That's Heritage's approach to creating bathrooms. Go beyond the everyday and bring colour and quirkiness into the equation. Be confident in your own sense of style. The beauty of these products is that they can work in so many different ways. Your new bathroom can be an amazing space. Be bold, be adventurous, be distinctively individual. Inspired by the stunningly beautiful Cotswold palace, Blenheim offers English Baroque style and symmetrical lines for a timeless look that is perfect for the modern home. Newly arrived to our Derby showroom, this elegant basin is displayed with the Abingdon console and Hemsby mixer tap both in Limited Edition, Rose Gold which is very much in vogue this season. Dorchester offers effortless elegance in either your city boutique or country pad. A neat fit if you want practical storage with Dorchester's square basin, WC, double-ended bath and Caversham freestanding furniture. Passionate about period drama? Sensuous Victoria exudes romantic opulence. From luxurious, double console basins with ornate pedestal legs to high level WCs. Choosing a magnificent freestanding bath creates the perfect centrepiece to your boutique retreat home. Indulge your fantasy for a bathing boudoir with a shimmering Holywell metallic effect acrylic bath to soak up the ambience centre stage. Deliciously deep for blissful relaxation with smooth, soft curves for comfort. Add texture, with tactile rugs, plush velvet and ornate mirrors to enhance its sensuality. We've opted for an on-trend metallic and blush backdrop to our shimmering masterpiece. 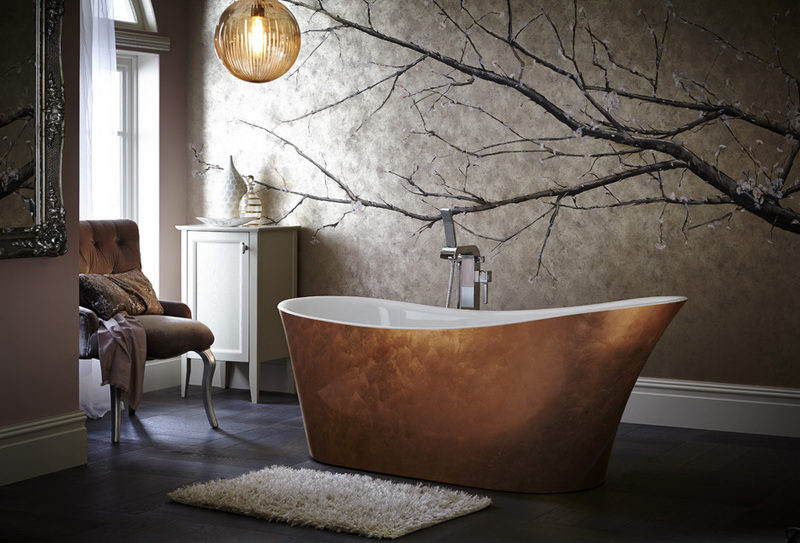 Holywell freestanding bath, shown here in Copper, is now on display at our Chesterfield Bathroom showroom. Group a few items gathered from around your home to help soften your bathroom. Packaging can be very boring, so try decanting everyday things into beautiful containers and jars for a more professional touch. Enduring opulence from a bygone era. Surround yourself with bold, angular lines and architectural integrity. Style with a beautiful cast iron bath like Buckingham for period glamour. THE MIRRORS. Complement your style and add a light reflecting mirror to cast a little luxury into bath time. Our new Heritage mirrors come in a wide range of colours and textures including lustrous, hand leafed gold and silver for an opulent finish. THE FURNITURE. Create space that complements your distinctive style with Heritage's clever Caversham bathroom furniture. What's more they offer a range of five coloured finishes plus a choice of worktops and handles, which gives you all you could want to really personalise your space.